This is one of my purely knitting posts. She doesn’t know it, but I owe a debt of gratitude to the lovely Hels for bringing on my knitting skills over the past month. It started when she asked me to knit two garish hats for some newly arrived twins. Although I’ve knitted in the round using double pointed needles and I’ve knitted straight using circular needles, I’d never actually knitted in the round on circular needles (which seems silly now I think about it). To knit the teeny tiny hats (from this pattern), I mastered the ways of the magic loop method. Whilst I did like using DPNs, it’s a little bit like wrestling with an angry hedgehog at times and I suspect that this is one of the reasons that my ongoing sock project has remained ongoing for nearly three years now. 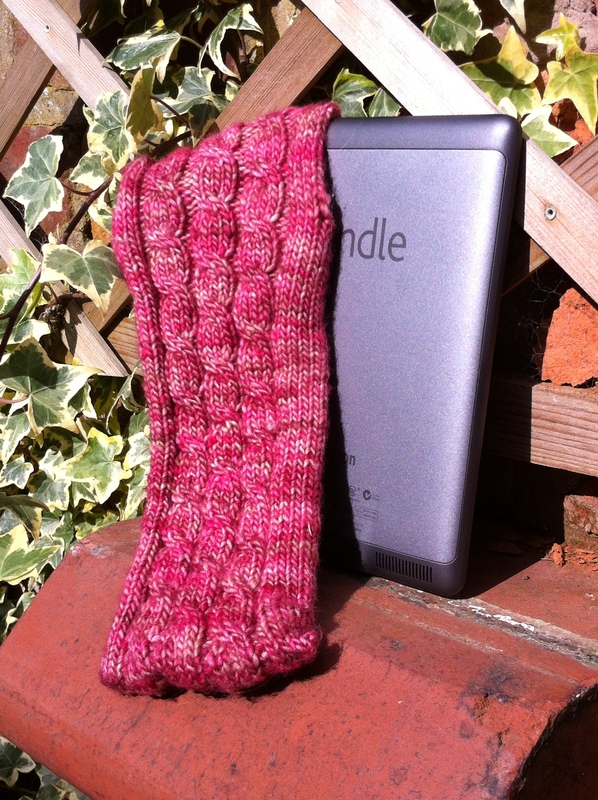 Armed with the skills of the magic loop, I announced my intention to knit a Kindle cosy. Now, it might be a hangover from the time I served with the Brownies, but I do like an owl and owls seemed appropriately bookish for this project. 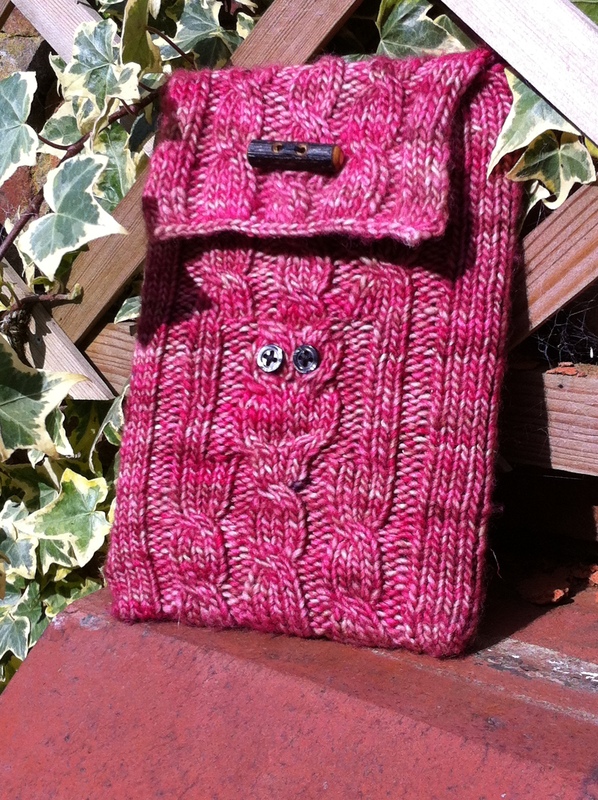 Searching Ravelry for a bit of guidance, I ended up going for an amalgamation of this cabled Kindle sleeve and this owl coffee cosy. However, to do this I needed some more new knitting skills – how to do a magic cast on to join the ends of the sleeve and how to cable without using a cable needle (I can barely cable using a cable needle…). So not only do I have an owlish cosy for my Kindle, but I also have a little stash of new knitting skills to add to my bag. Oh, and having learned to love magic loop, I went to my nearby lovely wool shop to get some 2.5mm needles only to find that they were out of the long length that I would need. The end result of this is that the owner showed me yet another technique that I had never understood in the past – how to knit in the round using two short circular needles. 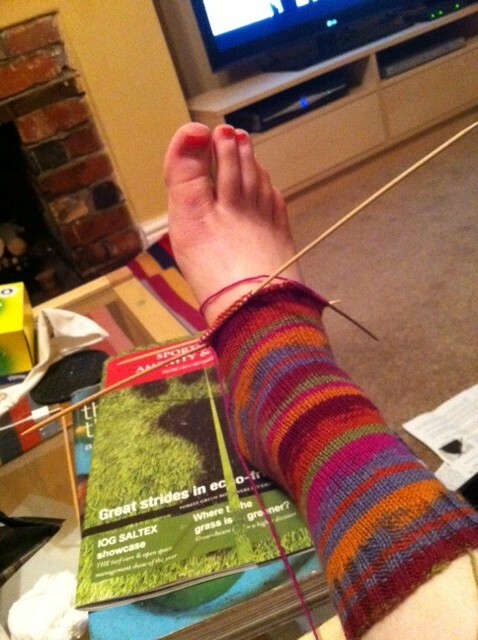 I did suspect that this may be a ruse to sell me twice as many needles, but it’s so easy that I have actually finished my sock! One done, one cast on. 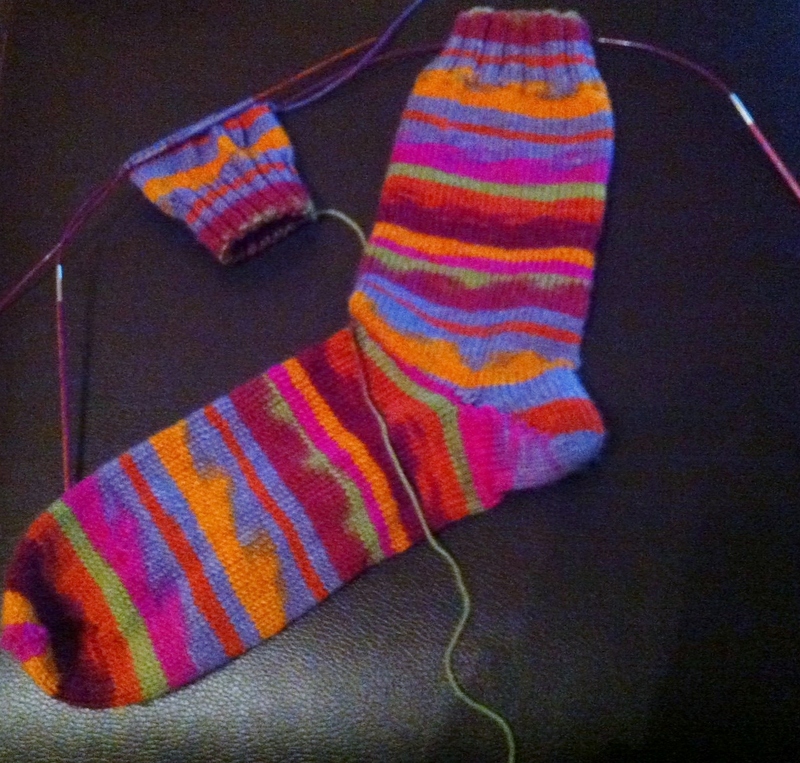 I aim to have finished the pair before 2015.
awesome socks! I’ve used magic loop and the two circs method, but have to say i prefer the dpns. Love the socks and the owl. Really clever. I love the comment about finishing the socks before 2015! !